International advocacy organisation Global Citizen today announced that DStv, SABC, Viacom’s MTV International, Canal+, MSNBC and iHeartMedia will be the broadcast partners for the Global Citizen Festival: Mandela 100 airing a combination of live, highlights and exclusive behind-the-scenes content of the epic event held in Madiba’s honour. Mandela 100 is a free-ticketed event, which will take place on Sunday, 2 December 2018 at the FNB Stadium in Johannesburg, South Africa. The broadcast will be transmitted in over 180 countries across six continents. DStv will broadcast the event live to all its satellite customers throughout South Africa and sub-Saharan Africa on a dedicated channel 199. It will also serve as host broadcaster, feeding the telecast to our media partners around the world. SABC will carry the show live across South Africa on SABC1, the nation’s leading terrestrial broadcast channel. Canal+ will broadcast the show to its audience across Francophone Africa. The live broadcast will include select performances by Beyoncé and JAY-Z. MTV International will bring the festival to fans in nearly 180 countries and territories outside the US, from Australia to Argentina and beyond, mixing edited highlights with live performances from Johannesburg. MTV Base will also debut a two-hour, “best of” special in the days following the initial broadcast for its audience in South Africa and nearly 50 countries across sub-Saharan Africa. An edited down version of The Global Citizen Festival: Mandela 100 will air in the United States on MSNBC on Sunday, December 2 from 9 pm ET to 12 am ET. The broadcast will be hosted by MSNBC’s Reverend Al Sharpton and Joy Reid. iHeartMedia will broadcast from FNB Stadium on Sunday, December 2 from 9 pm ET to 12 am ET and will air on 150 radio stations across the U.S. and stream on the iHeartRadio app. Charlamagne Tha God – multimedia personality, best-selling author and co-host of iHeartMedia’s The Breakfast Club, the popular morning show syndicated on Hip Hop and R&B stations nationwide – will be on site and will host the iHeartMedia broadcast. The collective reach of its broadcast partners will deliver the largest reach of any television broadcast of a Global Citizen event to date. 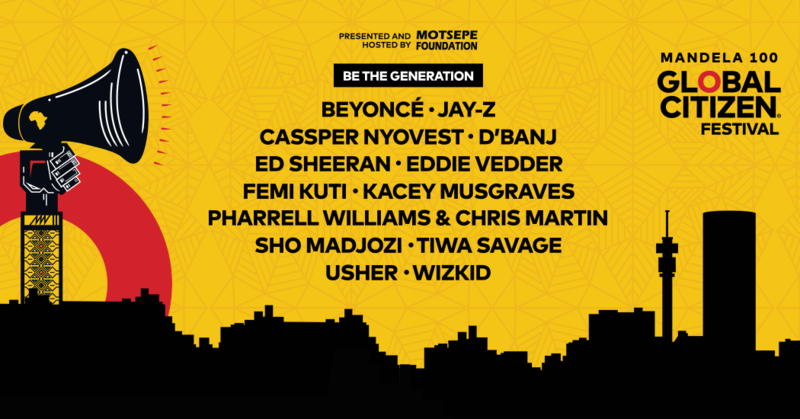 Beyoncé & JAY-Z, Black Coffee, Cassper Nyovest, D’banj, Ed Sheeran, Eddie Vedder, Femi Kuti, Kasey Musgraves, Pharrell Williams & Chris Martin, Sho Madjozi, Tiwa Savage, Usher, and Wizkid will headline the first Global Citizen Festival to be held in Africa. Leaders set to address the Global Citizen Festival: Mandela 100 include South African President Cyril Ramaphosa, Amina J. Mohammed, Deputy Secretary-General of the United Nations, Prime Minister Erna Solberg of Norway and President Nana Akufo-Addo of Ghana, who both serve as co-chairs of the UN Secretary General’s Advocacy Group for the Sustainable Development Goals, President Mokgweetsi Masisi of Botswana, President Paul Kagame of Rwanda, chair of the African Union; President Uhuru Kenyatta of Kenya; His Excellency Benedict Bengioushuye Ayade, Governor of Cross River State, Nigeria; Mrs. Graca Machel, UN Sustainable Development Goals Advocate; The Rt Hon Patricia Scotland QC, Secretary-General of the Commonwealth; Dr. Jim Kim, President of the World Bank; Phumzile Mlambo-Ngcuka, United Nations Under-Secretary General and Executive Director of UN Women; Ambassador Deborah Birx, U.S. Global AIDS Coordinator & U.S. Special Representative for Global Health Diplomacy; Dr. Tedros Adhanom Ghebreyesus, Director-General of the World Health Organization, Alexander De Croo, Deputy Prime Minister of Belgium, Gilbert F. Houngbo, President of the UN International Fund for Agricultural Development, David Beasley, Executive Director of the World Food Programme, Ambassador Ertharin Cousin, Board Director of The Power of Nutrition, and Peter Sands, Executive Director of the The Global Fund to Fight AIDS, Tuberculosis and Malaria. The December 02 event is the culmination of Global Citizen’s “Mandela 100” campaign in partnership with the House of Mandela; a series of global events honouring the life and legacy of Nelson Mandela in his centenary year. Over the course of the campaign, Global Citizens have taken an unprecedented number of actions to apply pressure on world leaders to make commitments at the Festival around the issues associated with extreme poverty; gender equality, food security, education, the environment, and global health.